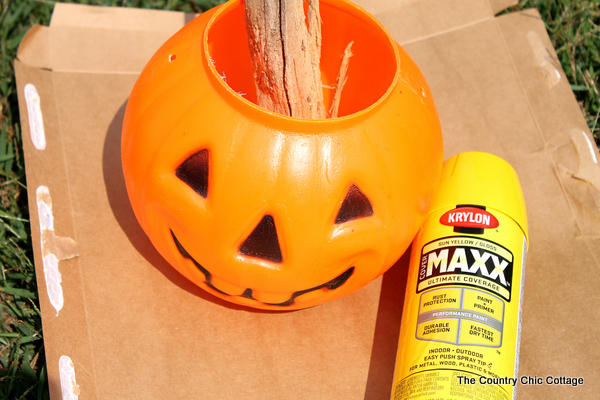 I am going to show you how to make a pumpkin planter today y’all. This super simple DIY idea can be made in just a few hours and your fall mums will look gorgeous in it! This post is sponsored by Krylon however all projects and opinions are my own. This is a part of the color of the month program from Krylon. I was asked to make something fall with Satin Iris and this is what I came up with. Y’all can let me know how I did in the comments section! I started with the large planter and the Iris paint. 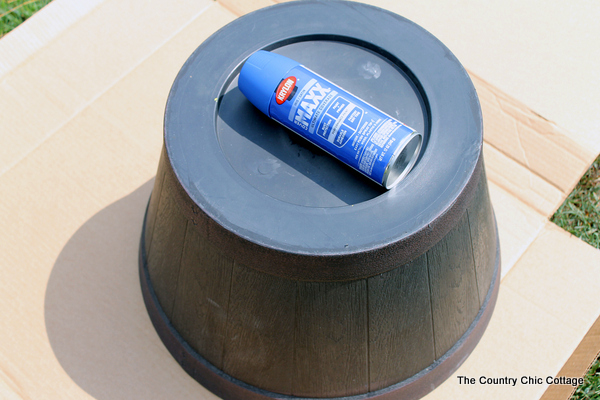 The Krylon CoverMaxx product is a primer and paint in one so this one can covered the pot easily. I actually painted the outside as well as the inside. I don’t like having a lip on the inside that is unpainted and not covered by dirt! Spray on the spray paint in light even coats. 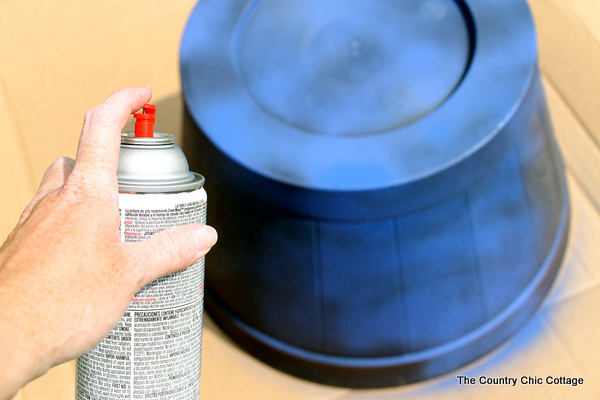 I use several light coats on all of my spray paint projects to avoid paint drips. I used the Bauhaus Gold on one pumpkin. 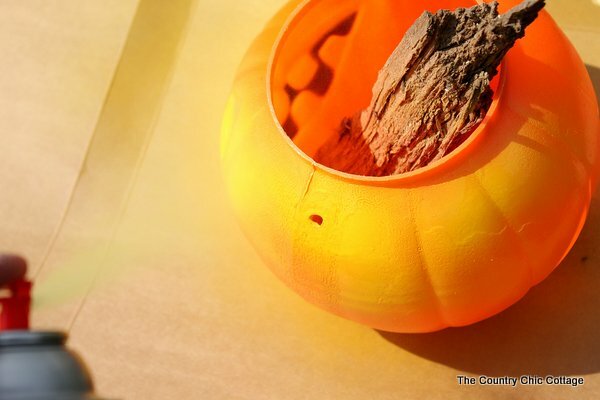 I dropped a piece of wood into the pumpkin to weight it down a bit. There is nothing worse that the wind turning over your freshly painted project. Again I sprayed with several light coats. The Krylon CoverMaxx covers well so that even those dark recesses got adequate coverage. I took the smaller of the two pumpkins and used the Sun Yellow on it. Again with a piece of wood for weight. Notice I removed the handle from this one as it will be my top pumpkin that will get planted with one of my mums. 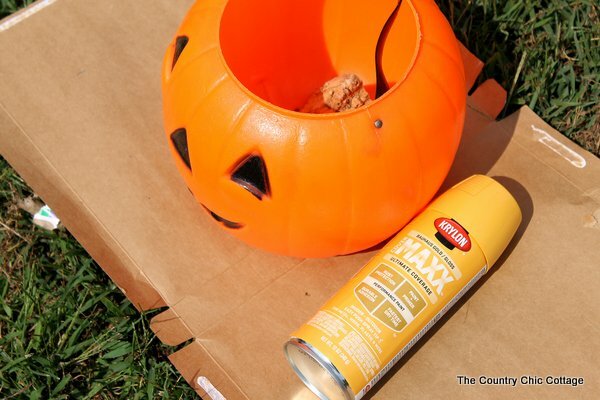 The super light color took a few coats but still one can was more than enough to cover this pumpkin. 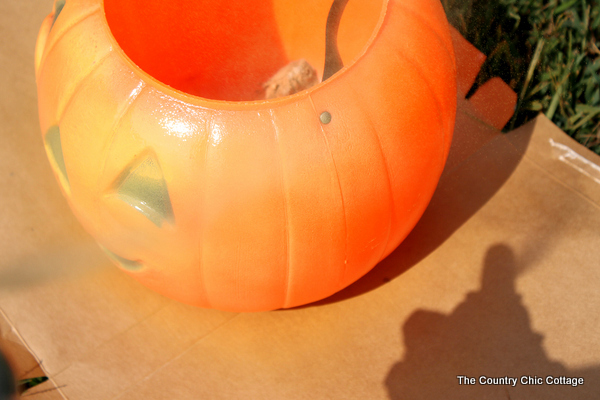 Drill holes in the bottom of each pumpkin for drainage. Add in a layer of rocks then some soil. 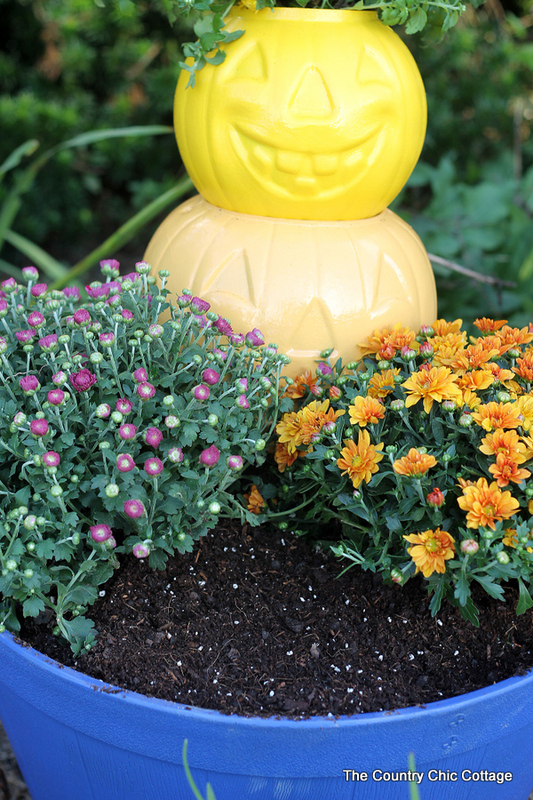 Your favorite mums will look great in these pumpkins! I actually stacked my pumpkins with a mum in the very top one as shown below. You can caulk these two together or rely on gravity. Add the stack to your large planter that is also filled with a layer of rocks and some soil. My mums have never been happier! 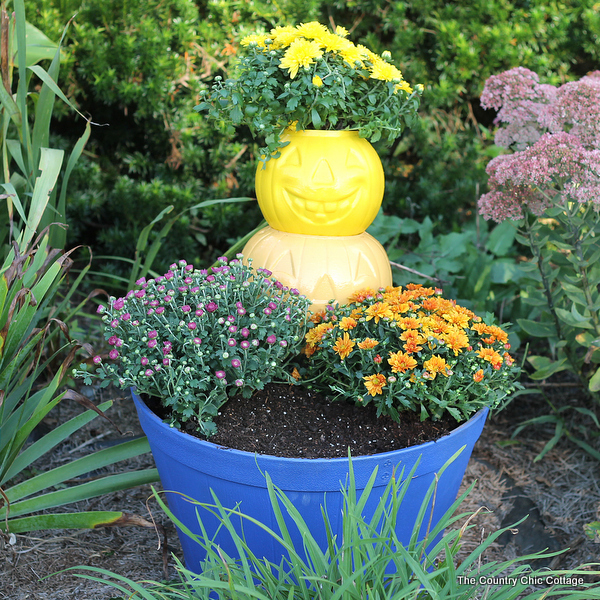 You can make a pumpkin planter of your very own following the instructions above. 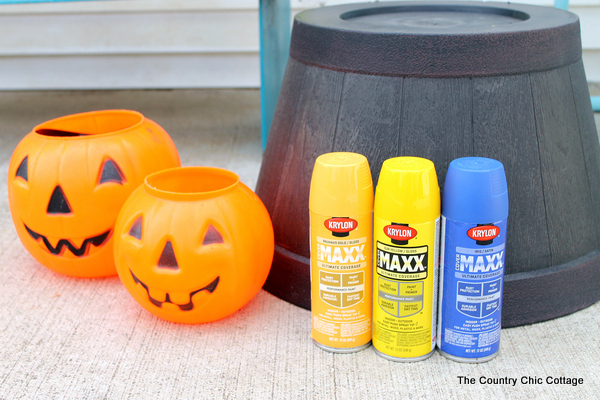 Turn a child’s trick or treat toy into something amazing all with a little Krylon CoverMaxx and some creativity! I enjoyed you pumpkin planter. Will be trying it. Have some fall mums we can use. Looking forward to trying it. 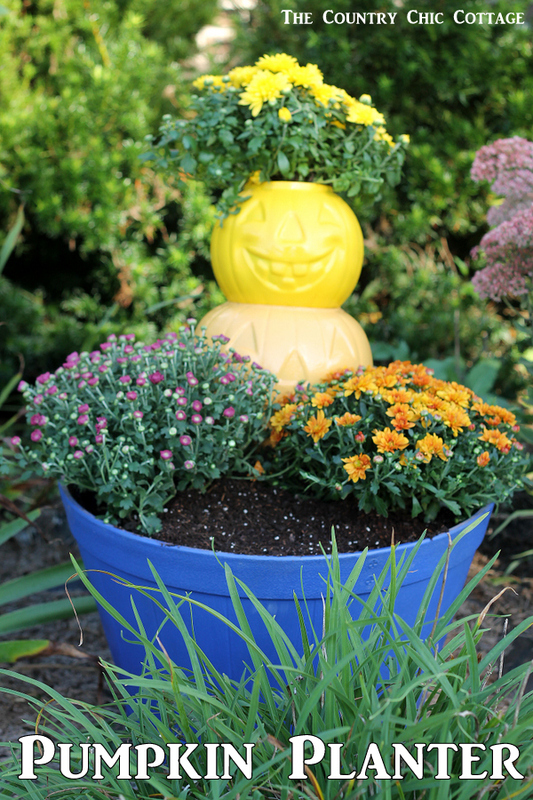 What a fun way to incorporate pumpkins into your garden . Too cute! I was looking for a way to paint my pumpkins pink and you’ve helped me. Thanks.